Discussion in 'AutoApps' started by s3018744, Apr 15, 2019. Hi guys! I have set up autoremote on my Android phone and tablet this weekend. It worked great when both devices were on the same wifi / connected via bluetooth. However when I leave home and try to have my phone send a message (via tasker) to my tablet it won´t work. I´m getting the following error (see screenshot). Also: if I´m trying to send a message from my PC at work to my phone via the https://autoremote.joaoapps.com/xyz page it won´t arrive. 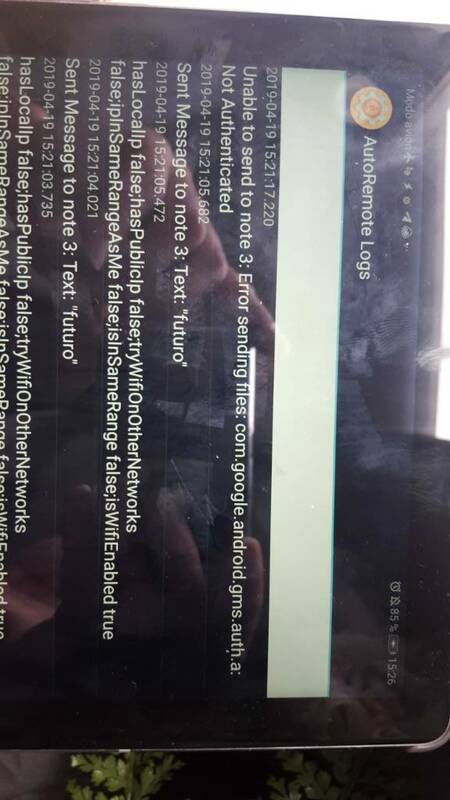 Incoming log only shows the messages that were sent from my tablet to my phone when they were on the same wifi / bluetooth connected. Hi @joaomgcd ! Thanks for your quick reply! Seems like restarting my phone solved the issue with the "sending a message from my PC to my phone" thingy. However sending a message from my phone to my tablet when I´m not home only works inconsistently. Sometimes it works, sometimes it does not (retrying X/5). I´m testing to set both apps (Autoremote + Tasker) to "not battery optimized" in Android Pie´s settings. No battery saver app installed. Will report if this does the trick.